Mocha Uson calls Mar Roxas a liar! Find out why! Home / News / Mocha Uson calls Mar Roxas a liar! Find out why! Just recently, a photo of Mar Roxas who has a sad smile on his face is circulating online. According to some reports, the said photo was actually taken from Hong Kong during a campaign rally. Meanwhile, the leader of the female group Mocha Girls, Mocha Uson has once again shared her thoughts about the viral photo. 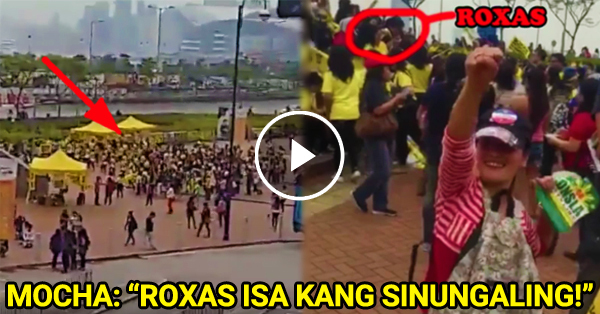 She posted something on her Facebook account that discusses Mar Roxas' campaign rally in Hong Kong. In some videos, Mar denied that there were only a few people who attended his campaign rally that was held on the same day of Duterte's campaign rally. Mar even stated that there were thousands of supporters who attended his campaign rally. But then Mocha disagreed with what he said, and even called Mar a liar for what he's claiming. Mocha insisted that there were only a few people who attended his rally and it couldn't even reach a thousand.